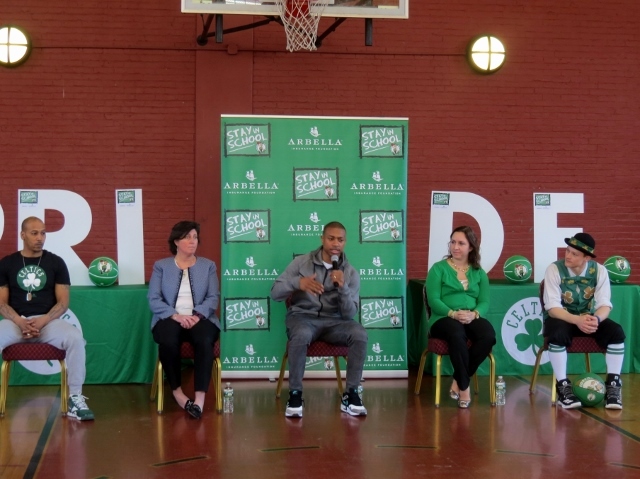 NBA All-Star Isaiah Thomas (center) speaks at the Nazzaro Center with retired local NBA player Dana Thomas (far left), Eliot Principal Traci Walker Griffith (2nd from left) and dunk superstar Lucky (far right). Eliot K-8 Innovation Upper School students celebrated the impressive and improved attendance rates in the Middle School with the Celtics Stay in School Assembly. 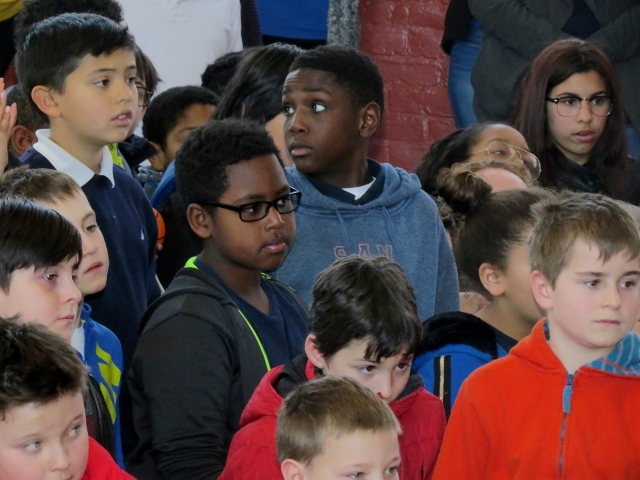 Students in grades 3-5 were shocked last Thursday when Celtics two time NBA All Star Isaiah Thomas, retired local NBA player Dana Barros, and Coach Willie May arrived at the Nazzaro Center to congratulate them on their efforts. 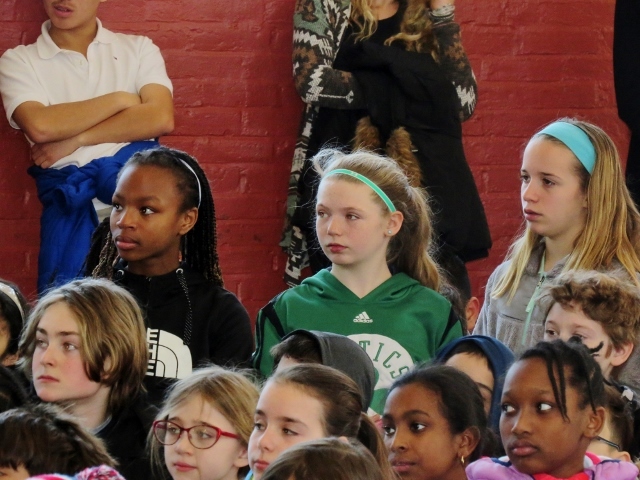 Students enjoyed hearing personal stories from each of the representatives, and watching Celtics slam dunk superstar Lucky perform some amazing tricks on the trampoline. We are extremely proud of our Middle School students for this amazing achievement, especially Sam Griffin, Omarey Reddick, Naimah Malone, Anayah Lopes Denis, Mikey O’Neil and Ana Heredia who were recognized for their perfect attendance all year long. We would like to extend a special thanks to everyone who supported their efforts towards improvement and to the many hands that made this celebration event possible. A huge shout out to Carl Ameno at the Nazzaro Center for hosting this event with us, John Borders IV for planning and our friends at Arbella Insurance. To watch more about the Celtic Celebration see this Channel 7 News Clip.